TaoGei is a unique game for the elderly that integrates reminiscence therapy and memory training. We have tried to create a game that allows the elderly feel comfortable using modern mobile devices through a game that helps with memory training. Usability testing for the game was carried out at a public aged care center in Taiwan, with users aged from 75 to 93 years old. Their input was used to improve the game and make it more user-friendly. 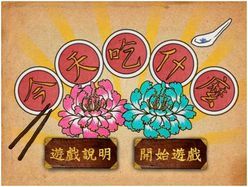 This game has been designed by the Elderly Welfare Promotion Group (EWPG) of Center of Innovation and Synergy for Intelligent Home Technology (Insight Center) at National Taiwan University (NTU). Insight EWPG is a team composed of various experts from the fields of engineering, medicine, psychology, history, and film making. The game is available on the Apple App Store; it is the top ranked educational application and 2nd ranked game in China, Taiwan and Hong Kong, and is also highly ranked among other Asian countries such as Malaysia and Singapore. TaoGei is romanization of the word for owner or proprietor in Taiwanese, a dialect of Chinese spoken by about 70% of the population in Taiwan. The aim of TaoGei is to train elderly users' visual and auditory memory by letting them run a roadside stand business virtually. In Taiwan, back in the 1960s, there used to be many roadside stands selling fast food, a common feature of developing societies and representative of people's strong work ethic. Eating at neighborhood roadside stands is therefore an evocative memory for those who grew up around this era in Taiwan, and it is something with which they identify. The scenario for the user is that the owner of a roadside stand has had to rush to the hospital to care for her injured husband, and she has asked the user to help by taking charge of their roadside stand. The visual style of the game is based on real street scenes from that time; elderly users will see familiar snack foods, ways of dressing, interacting, and so forth. The user has to take orders from various customers, memorize them, and also deal with lost-and-found items. 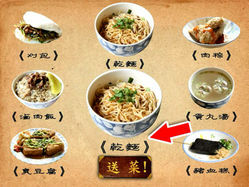 There are seven different traditional snack foods available, i.e. 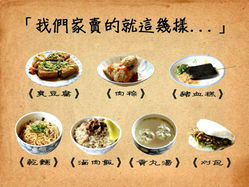 stinky tofu, sticky rice dumplings, pig blood cakes, dried noodles, braised pork rice, meat ball soups, and steamed sandwiches. There are six customers of different ages and gender. Our design is based on reminiscence therapy, a common psychological intervention in dementia care, which lets the elderly to integrate living arrangements by recalling people and things familiar to them; in addition to stabilize the mood, reminiscence therapy also helps the elderly maintain good mental health. The game tracks the performance of the user for each order and tracks improved memory performance of the user. In order to sustain user interest and help with memory training, our game is designed with an interactive interface that provides vivid visual and auditory information. There are two difficulty levels, basic and advanced, each with five challenges. Instead of simply correcting the user's mistakes, which may leave the user frustrated, the game provides feedback as positive reinforcement to increase motivation. 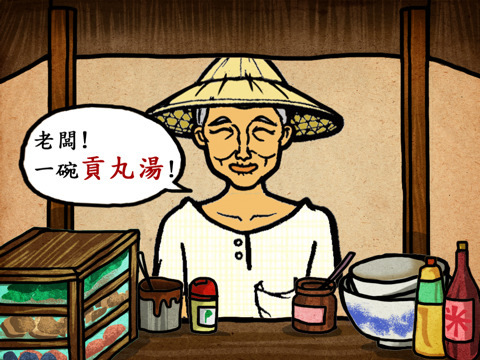 The game is available in Mandarin Chinese and in Taiwanese and may support other languages including English in the future. Elderly users who may be anxious and unsure about using technology feel encouraged to try this game thanks to the easy-to-understand interface and a visual style that reminds them of a familiar past.